I have started to get concerned about shows such as ‘The truth about…’ and ‘Twinstitute’. I do enjoy watching the shows but I worry that viewers take away an oversimplified ‘health’ message based on a single experiment that is designed for ‘good viewing’ rather than necessarily good overall scientific practice. In particular, I am thinking about experiments conducted on Truth about…fitness (shown a year ago but re-released recently on iplayer) and Twinstitute (first season showing now) which both compare the benefits of two different forms of exercise. The first thing that concerns me is the way the shows refer to, or imply they are referring to, current guidance. The current guidance is here…. 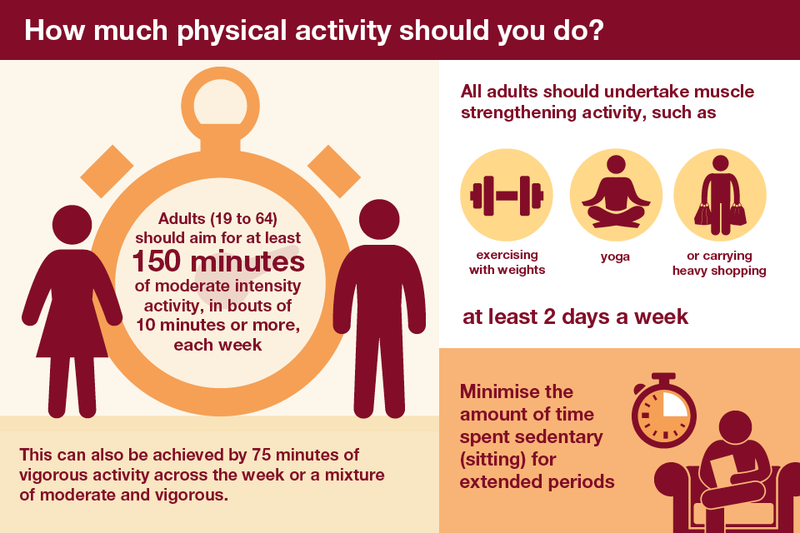 https://www.gov.uk/government/publications/health-matters-getting-every-adult-active-every-day/health-matters-getting-every-adult-active-every-day This is one of the infographics from that web-page…. The Twinstitute experiment shown on TV this week set out to compare a very high intensity exercise regime with what they said was ‘the guidance’ of 150 minutes moderate activity. They didn’t mention that the guidance already suggests you can combine moderate and vigorous activity and they didn’t mention the need to avoid being sedentary and do muscle strengthening activity. In presenting partial guidance, they mis-informed viewers about what the guidance is. The Truth about fitness experiment compared 3 x 10 minute moderate intensity walks a day with 10,000 steps a day. The 10,000 steps a day is referred to as a myth invented to market step counters – it may well be, but the way the show presents it makes an unaware viewer assume that it is part of the guidance. It isn’t. By contrast, the 3 x 10 minute walking per day is absolutely consistent with one element of the guidance (210 min rather than 150 min moderate activity) but perhaps could lead people to overlook the need to avoid sedentary activity and do muscle strengthening. Second, the TV studies are what you would call small-N studies. That means they don’t have many participants. Whilst Twinstitute rules out genetic differences as one possible cause of differences in the results, Truth about doesn’t. The small numbers mean that it is a big leap to generalise the findings to other individuals or other populations. Yet viewers are led to believe the results are what is best for them as an individual. Third, the TV studies are ‘intervention’ studies. That means you experiment by getting people to do something different to what they would have done. Often people are selected because they are ‘unfit’ or currently do little physical activity – they then do something – and get ‘fitter’. This is absolutely what is expected. Going from nothing to something is where you get the most gains, and the more vigourous that is the quicker the gains. Any physical activity is better than none. Start small and build up gradually. 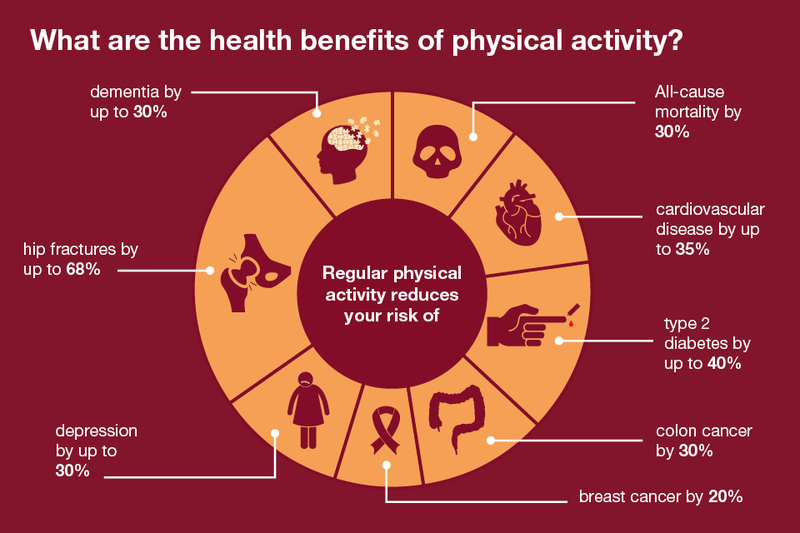 (Source: Public Health England). Fourth, as these experiments are short term. The measures used to determine ‘fitness’ are those that can change in a short period of time (e.g. blood pressure, V02 max). Twinstitute talked of ‘fitness’ but they also stated that the measures related to heart health. It means that the only thing these studies tell us is which activity leads to a better heart health over the period of the study. Nothing more. In contrast to the small N, short term, intervention studies, guidance is based on what are called cohort studies – studies that follow a lot of people for many, many years. As an example, here is a link to wikipedia’s description of the Whitehall studies (en.wikipedia.org/wiki/Whitehall_Study). Cohort studies record the activity levels participants do naturally and look at disease patterns that participants get over time. There is then a lot of data crunching to rule out differences such as smoking status and so on. I am not saying this science is ‘perfect’ the point I am making is it is different. I don’t think it is good scientific practice to suggest that people should take the conclusions of one type of study ‘above’ those of a different type without giving them the opportunity to fully explore the pros and cons of both. The other aspect that worries me is to do with the way the shows present exercise and physical activity. The experiments seem to be predicated on the idea that we want to get away with as little activity as possible – and any time spent doing it is a chore. That’s why it is so easy to feel tempted into the short but hard fix of high intensity exercise. But building an active lifestyle can actually be a pleasure. Yoga, gardening, walking in the park, dancing, running, cycling, swimming are enjoyable. Taking time to care for yourself in this way shouldn’t be pitched as something that is painful or annoying. If it feels like that then maybe it means you haven’t found the right combination of things to fit into your life and your interests (e.g. I can’t stand gyms but like running in the open air). I do think that producers and presenters of shows like this need to take a little more responsibility for the messages people take away. As a bare minimum, they should present the official guidelines, rather than mislead the public about them. They should highlight the limitations of their studies – even if they state they have included them on their website. They should make it clear what conclusions are appropriate/not appropriate to draw. And maybe they could also frame this as about different ways to enjoy ourselves and benefit our health long-term rather than the least time consuming way to get a short term benefit to our heart health. What system is it exactly? Have the three domains of public health practice had their day? I have started to get concerned about shows such as 'The truth about...' and 'Twinstitute'. I do enjoy watching the shows but I worry that viewers take away an oversimplified 'health' message based on a single experiment that is designed for 'good viewing' rather than necessarily good overall scientific practice. In particular, I am thinking about experiments conducted on Truth about...fitness (shown a year ago but re-released recently on iplayer) and Twinstitute (first season showing now) which both compare the benefits of two different forms of exercise.<span id="more-1917"></span> The first thing that concerns me is the way the shows refer to, or imply they are referring to, current guidance. 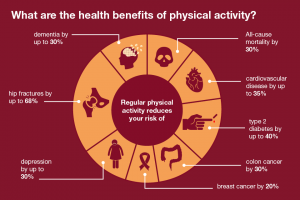 The current guidance is here.... <a href="https://www.gov.uk/government/publications/health-matters-getting-every-adult-active-every-day/health-matters-getting-every-adult-active-every-day">https://www.gov.uk/government/publications/health-matters-getting-every-adult-active-every-day/health-matters-getting-every-adult-active-every-day</a> This is one of the infographics from that web-page.... [caption id="attachment_1918" align="alignnone" width="300"]<a href="https://helen.wilding.name/wp-content/uploads/2019/01/6.2368_PHE_CP_Health_Matters_-_physical_activity_in_adults_online_960x640__2.png"><img class="size-medium wp-image-1918" src="https://helen.wilding.name/wp-content/uploads/2019/01/6.2368_PHE_CP_Health_Matters_-_physical_activity_in_adults_online_960x640__2-300x200.png" alt="" width="300" height="200" /></a> Source: Public Health England[/caption] This says three things.... <ul> <li>do 150 minutes of moderate activity or 75 minutes of vigorous activity (or combinations thereof) AND</li> <li>minimise sedentary time, AND</li> <li>do muscle strengthening activity</li> </ul> The Twinstitute experiment shown on TV this week set out to compare a very high intensity exercise regime with what they said was 'the guidance' of 150 minutes moderate activity. They didn't mention that the guidance already suggests you can combine moderate and vigorous activity and they didn't mention the need to avoid being sedentary and do muscle strengthening activity. In presenting partial guidance, they mis-informed viewers about what the guidance is. The Truth about fitness experiment compared 3 x 10 minute moderate intensity walks a day with 10,000 steps a day. The 10,000 steps a day is referred to as a myth invented to market step counters - it may well be, but the way the show presents it makes an unaware viewer assume that it is part of the guidance. It isn't. By contrast, the 3 x 10 minute walking per day is absolutely consistent with one element of the guidance (210 min rather than 150 min moderate activity) but perhaps could lead people to overlook the need to avoid sedentary activity and do muscle strengthening. Second, the TV studies are what you would call small-N studies. That means they don't have many participants. Whilst Twinstitute rules out genetic differences as one possible cause of differences in the results, Truth about doesn't. The small numbers mean that it is a big leap to generalise the findings to other individuals or other populations. Yet viewers are led to believe the results are what is best for them as an individual. Third, the TV studies are 'intervention' studies. That means you experiment by getting people to do something different to what they would have done. Often people are selected because they are 'unfit' or currently do little physical activity - they then do something - and get 'fitter'. This is absolutely what is expected. Going from nothing to something is where you get the most gains, and the more vigourous that is the quicker the gains. <blockquote>Any physical activity is better than none. Start small and build up gradually. (Source: Public Health England).</blockquote> Fourth, as these experiments are short term. The measures used to determine 'fitness' are those that can change in a short period of time (e.g. blood pressure, V02 max). Twinstitute talked of 'fitness' but they also stated that the measures related to heart health. It means that the only thing these studies tell us is which activity leads to a better heart health over the period of the study. Nothing more. This framing leads viewers to assume that 'fitness' and activity guidelines are solely about heart health. However, the guidance concerns the prevention of a range of health conditions. 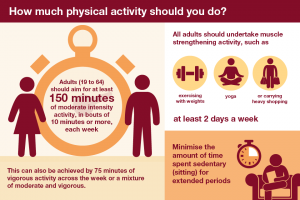 Here is another infographic taken from the web-page (link above)... [caption id="attachment_1919" align="alignnone" width="300"]<a href="https://helen.wilding.name/wp-content/uploads/2019/01/6.2368_PHE_CP_Health_Matters_-_physical_activity_in_adults_online_960x640__6.png"><img class="wp-image-1919 size-medium" src="https://helen.wilding.name/wp-content/uploads/2019/01/6.2368_PHE_CP_Health_Matters_-_physical_activity_in_adults_online_960x640__6-300x200.png" alt="" width="300" height="200" /></a> Source: Public Health England[/caption] In contrast to the small N, short term, intervention studies, guidance is based on what are called cohort studies - studies that follow a lot of people for many, many years. As an example, here is a link to wikipedia's description of the Whitehall studies (en.wikipedia.org/wiki/Whitehall_Study). Cohort studies record the activity levels participants do naturally and look at disease patterns that participants get over time. There is then a lot of data crunching to rule out differences such as smoking status and so on. I am not saying this science is 'perfect' the point I am making is it is different. I don't think it is good scientific practice to suggest that people should take the conclusions of one type of study 'above' those of a different type without giving them the opportunity to fully explore the pros and cons of both. The other aspect that worries me is to do with the way the shows present exercise and physical activity. The experiments seem to be predicated on the idea that we want to get away with as little activity as possible - and any time spent doing it is a chore. That's why it is so easy to feel tempted into the short but hard fix of high intensity exercise. But building an active lifestyle can actually be a pleasure. Yoga, gardening, walking in the park, dancing, running, cycling, swimming are enjoyable. Taking time to care for yourself in this way shouldn't be pitched as something that is painful or annoying. If it feels like that then maybe it means you haven't found the right combination of things to fit into your life and your interests (e.g. I can't stand gyms but like running in the open air). I do think that producers and presenters of shows like this need to take a little more responsibility for the messages people take away. As a bare minimum, they should present the official guidelines, rather than mislead the public about them. They should highlight the limitations of their studies - even if they state they have included them on their website. They should make it clear what conclusions are appropriate/not appropriate to draw. And maybe they could also frame this as about different ways to enjoy ourselves and benefit our health long-term rather than the least time consuming way to get a short term benefit to our heart health.